AsiaMs.net | Asian American Women's Site: Are Asian Foods Slimming? Asian foods are supposed to be the healthiest. So why do we feel tense and bloated after eating in Asian restaurants? “Just drink tea. It takes away all the fat,” said a waitress at a Chinese restaurant when we asked her to go easy on the oils. If only it were that simple! Tea does help break down oily substances but eating a healthy, low calorie Asian meal takes more than washing down with green tea. Rice and noodles – high in carbohydrates – and vegetables and fruits – low in saturated fats – are the key ingredients in Asian foods. At least in theory typical Asian meal should quickly convert to energy and are not absorbed into fat cells. In Chinese cooking, stir frying keeps most of the vitamins and minerals intact and sesame oil is high in monosaturated and polysaturated fats that help lower blood cholesterol levels. Unfortunately few Americans eat Asian food that way. Add a fried won-ton, thick hoisin sauce, deep fried squid or too much oil and you’re in trouble. Also most popular Asian barbeques, like kalbi, are smothered in sugar and the meats are marblized with fat. And high sodium content promotes increased rice consumption to wash it all down with, and calorie count starts shooting up. All that carbo in rice turns to sugar in your system. That is why, after a feast at an Asian restaurant, you can feel bloated and sometimes wake up thirsty in the middle of the night. Let’s start with the basics. A woman needs 1,500 to 2,500 calories a day depending on her size and weight. For a truly healthy diet, half of those calories should come from carbohydrates and only 20% from protein. 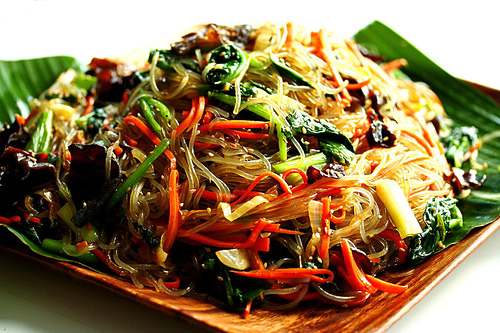 Rice, noodles and vegetables are mainly carbohydrates so they are safe as long as you curve the amount of intake. But the sauces and oils are laden with fat. Fried rice, for example, has about13 grams of fat while plain rice has none. Stay away from beef, pork and ducks. If you must have char siu or beef teriyaki, use lean meat and in small portions. Substitute with tofu instead. It’s really easy to produce a healthy, low-cal dish, once you’ve disciplined yourself. First, avoid deep fried and battered foods like tempura, or sweet and sour meats. One tablespoon of vegetable oil has 120 calories which is pure fat and some oils are even harmful. Palm oil has 51% saturated fat and coconut oil has 92% saturated fat. One of the bet ways to infuse taste is to use flavorful spices. Lime and lemon juice, wine, vinegar, garlic, pepper, chili, horseradish and basil are excellent taste enhancers, much better than sugar laden sweet and sour, hoisin, plum, teriyaki and oyster sauces. Excessive sodium is also a big problem with Asian foods. USDA recommends 3,000 milligrams of sodium a day but one tablespoon of soy sauce alone has 1,000. It’s easy to see how you could be well over the health limit with just one dish. The amount of coconut milk and sugar used in Thai cooking is dangerous to waist-watchers. They’re like the evil cheeses and butters in Western cooking. So go light on curries, sticky rice, coconut based soups, shrimp paste and peanut sauces. Tom Yum Gung, on the other hand, is an example of a healthy dish. It is one of the world’s healthiest because it uses less sugar, coconut, and meats. Instead the light flavoring is combined with lots of fresh vegetables. Even the fish sauces and oils are lighter and lower in sodium than Northern Chinese. A serving of ga xe phay, diced chicken with mint leaves, contains only about 100 calories and 2 grams of fat. Shrimp with fish sauce contains 178 calories with 7 grams of fat. But of course, their fried foods are to be avoided.